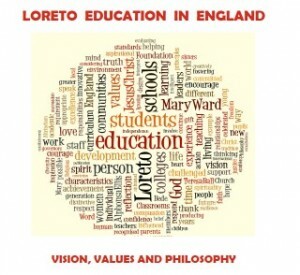 Some years ago our Loreto schools and College launched a new document entitled ‘Loreto Education in England – Vision, values and Philosophy’, the front page of which you see here. This document is the outcome of many meetings over many months attended by representatives from each of our 5 educational establishments, together with Maureen Mee, Sr Kathryn Keigher and myself. In the course of our meetings we prayed, studied our Loreto heritage, discussed much and shared our hopes and dreams for the future of our schools and college. Maureen skilfully noted the fruits of each of the meetings and eventually the document began to take shape. We shared it in this embryonic stage with the Loreto Sisters first, as we felt it important that they were able recognise in it the Mary Ward vision. It was then shown to the Headteachers and Principal to ensure that they could present it with confidence to all their members of staff and draw value from working with it together in the years ahead. The next step was to incorporate photographs and art work, most of it from our students and to devise the front cover using a programme which draws out from the document the most important and relevant words sizing them according to frequency of use. On the back of the document is the Loreto crest – our unifying logo – recognised by all our students, past and present. The document, now in the hands of all our staff and Governors, has been very well received. We have recognised in our working together just how our history has made our schools what they are. It has made us realise, too, that our history – our story – must be told- not for yesterday’s world and students, but for our world today and for our present and future students. We owe a debt of gratitude to the many Sisters – Head teachers and teachers – whose life was the schools; to dedicated members of staff, past and present and to all the students who have ever walked through our school gates. They have all been an influence on our present Loreto philosophy of education and we are all the richer for that.